A neolithic tomb converted into a tiny chapel. 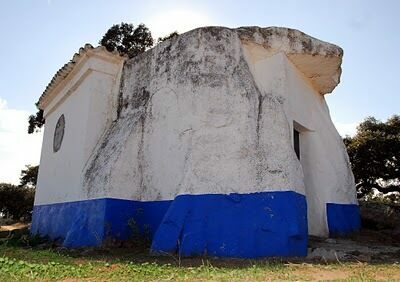 Help improve Atlas Obscura by expanding Dolmen Chapel of Sao Brissos with additional information or photos. 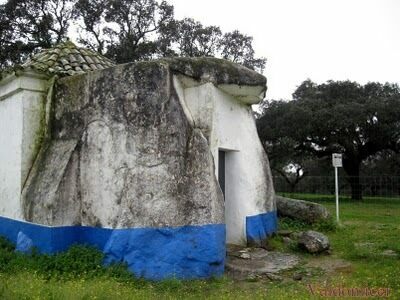 About 350 years ago this Neolithic dolmen was converted into a small Catholic Chapel known as Chapel of São Brissos Cromlech. Dolmens, sacred monuments made of standing stones capped with a top stone, appear throughout Western Europe, but rarely, if ever, have they been converted to new use in such a way. "Portugual's Stonehenge" is made up of nut-like stones aligned with the heavens. This crumbling Portuguese ruin overlooks the populace it once ruled. Pagan monument converted to Christianity with the population. A series of carved figures that scandalized British society. Fragments of human bones are embedded in the walls of this quaint alley. Legend says this demonic carving inside a medieval cathedral was one of Satan's minions. An architectural oddity hides in plain sight on this iconic London bridge.